In a contest where it was expected to be a high scoring affair as the last couple regular season games were of that caliber, the pitching and defense had other ideas as the Sultans used timely hitting to prevail. Steele Canyon had opportunities in the first three innings as JJ Venzor (1-3), Bianca Morales (1-2) and Audrey Bagge (2-3) all singled but each time the Sultans would get out of the inning. Santana, on the other hand, was shut out in the first couple of innings before Emma Leggett (1-2, R) singled in the bottom of the third. However the next two batters would be retired and it looked like the leadoff hit would be all for not until Madison Mendez (2-3, 2 RBI) came up and lined a ball that went for a hit and Leggett used her wheels to come around to score to give Santana a 1-0 lead. The one run lead would stand as both teams held each other in check until the bottom of the fifth inning. Leading off for the Sultans, Shelby Holmquist (1-3, 2B) came up and roped a ball to center that allowed her to reach second for a double, Brittany Munday (RUN) in to run. 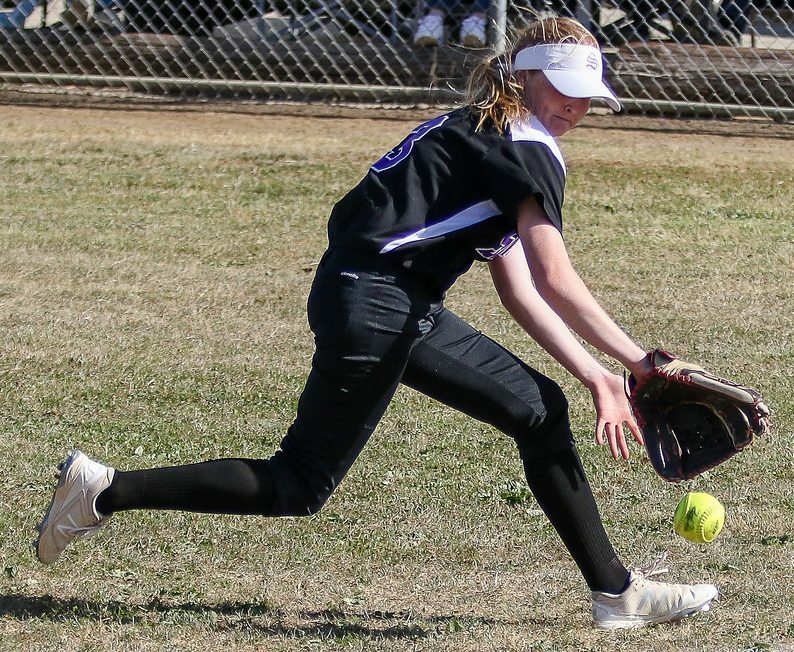 A couple batters later Natalie Sims (1-1, R, RBI, 2B) smoked another ball that went over the center fielder’s head to the fence allowing Munday to come around and score and Sims to move to second for another double. The Sultans were able to push across another run with two outs as Mendez blooped a ball to left field that fell in allowing Sims to come in and score to make it 3-0. Moving to the top of the sixth the Cougars knew they had to get something going and thought they had something going as Bagge singled with one out but Mendez was able to strike out the next two batters to end the inning. They would go down in order in the top of the seventh to end the game. For the Cougars in the loss, Grace Richter went 6 innings giving up 3 runs which were all earned on 5 hits while walking 2 and striking out 5. On the other side, Mendez for the Sultans tossed a complete game 7 innings for the victory giving up 0 runs on 4 hits while walking 0 and fanning 10. It was all Granite Hills from the start as they scored all their runs over the first four innings to garner the convincing victory over West Hills. For the Eagles in the bottom of the first inning Kara Blanchard would start the damage as she roped a double to score Rylee Omahen (1-3, R) who led off with single to make it 1-0, Haley Johnson (3-3, 2R, 3 RBI, 2B, HR) the next batter continued as she took the offering and hammered it over the center field fence for the 2-run jack making it 3-0, Staci Chambers (2-3, R, 3 RBI, 2B, HR) proceeded with a double, Aylani Ottley (RUN, SB) into run, she would later score on a steal of home. West Hills was able to scratch back in the top of the second inning as Carly Bursch (1-2) singled with one out, Dakota Mershon (RUN) in to run for Bursch, Gabby Clippinger (1-2, 2B) doubled, Savanah Henderson is hit by a pitch, Mershon was able to score on a wild pitch which made it 4-1. Unfortunately, that was the only run of the inning for the Wolf Pack as the Eagles got out of the jam. Granite extended their lead in the bottom of the second inning as Chambers blasted a 3-run shot over the left field fence which scored Blanchard and Johnson. Leading 7-1 the Eagles added more when Amaya Esparza (2-3, R, 4 RBI, 2B, HR) doubled to center to score Bailey Wallace (1-1, R, SB) and Catie Dobbs (RUN) who scored on the throw to make it 9-1. Despite trailing the Wolf Pack tried to cut the deficit in the top of the third as Alyssa Bubar walked with one out which was followed by a base hit by Ashleigh Hartwig (1-2). However, the Eagles got out of the inning when Chambers induced the ground ball double play to end the inning. The Eagles scored another run in the bottom of the third when Johnson smashed a double to score Julia Tysling (1-3, R) and they would round out their scoring on a two-run bomb by Esparza in the bottom of the fourth inning which scored Brooke Bertussi (1-1, R). For the Wolf Pack in the loss, Bursch went 3 innings giving up 10 runs of which 8 were earned on 10 hits while walking 2 and striking out 3. 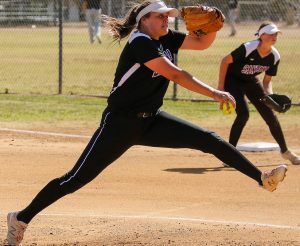 Chambers got the victory for the Eagles as she went 5 innings, allowing 3 hits and 1 run while walking 1 and striking out 6.